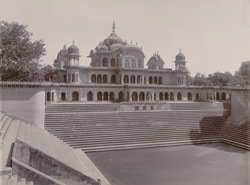 Photograph from the Curzon Collection, of Baldeo Singh’s chhatri at Gobardhan, Rajasthan, taken by the studio of Priyalall & Company in c.1900. Baldeo Singh (ruled 1823-1825) was the ninth Maharaja of Bharatpur, the capital of the Jat state. His chhatri or cenotaph is one of four memorial shrines to the Maharajas of Bharatpur at Gobardhan, which is also a site of Hindu pilgrimage. The chhatri is built of sandstone and stands at the western end of a formal garden or char bagh divided into quadrants in the Mughal style. Adjacent to the garden is a tank or reservoir which the chattri overlooks to the rear. This view from the north-west shows the west façade of the chhatri with the steps of the tank in the foreground.